Leafy silver cufflinks, designed and handmade by Diana Greenwood. A great gift for Father’s Day or for the Groom on his special day, these elegant and stylish silver leaf cufflinks could be the perfect finishing touch. The silver leaf cufflinks are hand pierced in sterling silver making each leaf unique. The satin finish on the leaves really contrasts the vein detail on the leaf. Each piece of my jewellery is handmade by myself in my Surrey based studio and all my pieces come in a beautiful white box with my logo and tied with a ribbon. I also include a card which details how to clean and care for the cufflinks. All my jewellery is made in sterling silver. To clean satin surfaces, use silver dip, rinsing thoroughly in clean water. Shiny surfaces can be cleaned by an occasional rub with a silver cloth. When not being worn, store in the box with acid free tissue paper. With all items of jewellery, avoid contact with perfume, detergents, hair products etc. Teeny Daisy and Circle earrings in silver and 18ct gold. Silver Beech Leaf stud earrings. 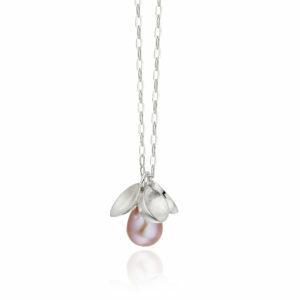 ARTGEMS Single pearl drop pendant.